Does Sandy Hook Shooting Spell Game Over for Violent Video Game Stocks? Violent video games are coming under fire again -- but this time the collateral damage may be serious. Senator Jay Rockefeller introduced a bill in Congress last week that directs federal agencies to study the influence of violent video games on children. In it, he calls on the National Academy of Sciences to lead the investigation and come back with an actionable report by 2014. Video game publishers obviously weren't too happy about that. Intense combat games have proven to be the battered industry's biggest hits lately, and they can't afford to make those games more restrictive than they already are. Then again, after the tragic Sandy Hook shootings earlier this month, a lot of things are on the table. Last week was rough for owners of video game stocks. Take-Two Interactive took the biggest hit, and it's easy to see why. The modest-sized developer's biggest franchise by far is the Grand Theft Auto series. Stealing cars and shooting up baddies is part of the game, and the company recently announced that Grand Theft Auto V will come out early next year. EA's hit was a bit of a surprise. Yes, EA makes plenty of shoot-em-ups, but it's also the company with the iconic EA Sports franchise that delivers steady annual installments of football and soccer games. 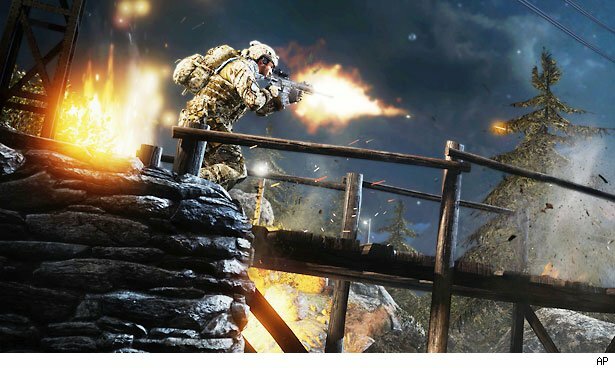 Activision Blizzard set industry sales records last month with the release of Call of Duty: Black Ops 2. As the niche leader, the company's name is going to come up in any debate about violent video games. GameStop is the leading standalone retailer for video games. If it's going to be harder for teens to get their hands on violent games in the future -- or if the industry finds that the games just aren't lucrative enough to continue making -- the small-box store will feel the pinch. Diehard gamers will argue that it's wrong to go after their entertainment. Tens of millions of players fire up multi-player sessions of Call of Duty games, and they have no need to re-create the violence in the real world. Video games -- like movies -- are a form of escapism. The multi-player nature of many games today encourages social interaction, and that's something that could actually help straighten the mindset of the loner outcast that may resort to violent real-world outbursts. Spending free time playing games may also keep some youths out of causing havoc in the real world. It can also be argued that mass shootings have taken place long before video games or even violent movies and TV shows were around. There may very well be a bigger issues at play here. And that's what this bill is all about. It's a study to get to the root of the matter. It's a starting point. It won't be the end of the gaming industry as we know it. Motley Fool contributor Rick Aristotle Munarriz has no positions in the stocks mentioned above. The Motley Fool owns shares of Activision Blizzard and GameStop. Motley Fool newsletter services recommend Activision Blizzard, GameStop, and Take-Two Interactive.